You make a bevel when you cut the edge of a board at any angle other than 90 degrees. Dimensioned lumber comes with square edges, which means the angle between the face of a board and its edge is 90 degrees. If you want to change this angle to anything other than 90 degrees, you have to make what is known as a bevel cut. 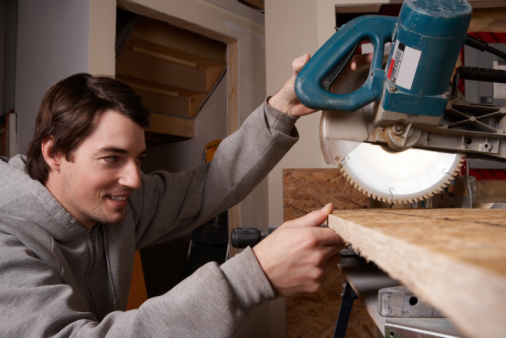 You can do this with several tools, including a table saw, a circular saw, a router and even a jigsaw, although the latter won't give very accurate results. Bevel cuts are often decorative. Cabinet trim, interior moldings and picture frames look more elegant with beveled edges than they do with straight ones. Beveling isn't just for looks, though. It's often a necessary procedure to fit moldings, and it's a common technique in joinery. 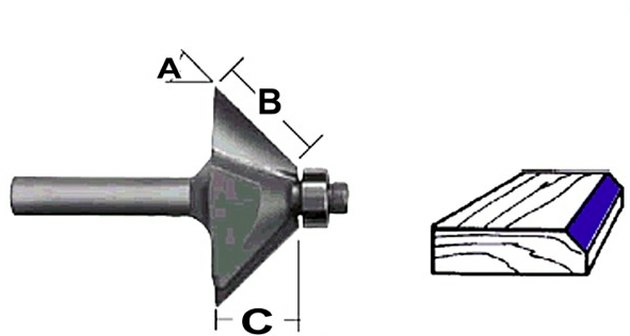 One purely functional woodworking standby, the French cleat, relies on a bevel cut to do its job, which is to support heavy objects from a wall. 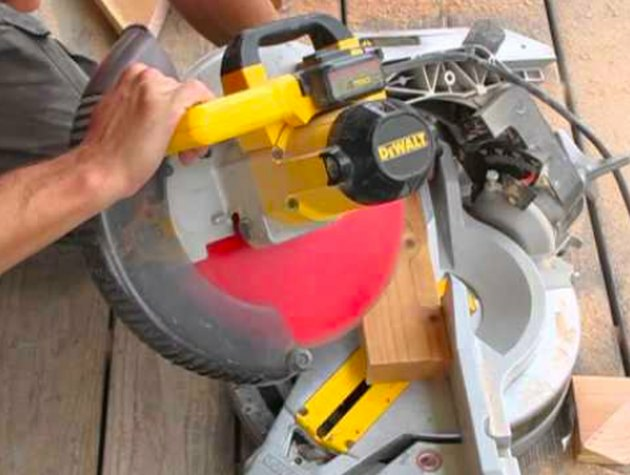 A compound miter saw makes a miter cut and a bevel cut at the same time. Like a bevel cut, a miter cut is also an angle cut, and it's one that carpenters frequently have to make. The most common miter cut is a 45-degree angle at the end of a trim board for a door or window. A miter cut doesn't alter the angle of the edge of the wood with the respect to the face. Two pieces of wood that have been mitered to form a 90-degree corner have edges that are parallel to each other. That's because the angle of the blade that cuts a miter is parallel to the edge of the wood and perpendicular to the face. 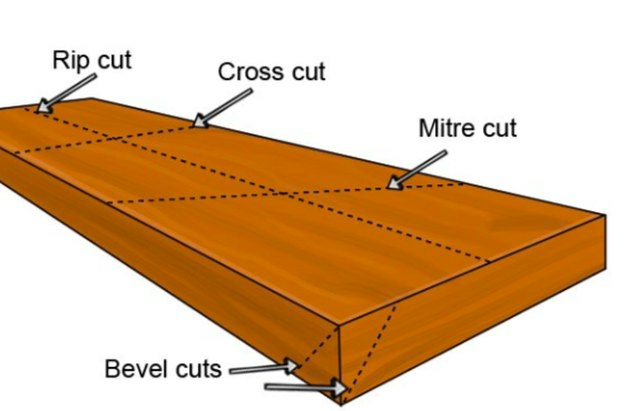 If you want to make a bevel cut, you have to change the angle of the blade with respect to the edge and face of the piece of wood you're cutting. You can do this at the same time as you make a miter cut by using a compound miter saw, which has blade angle adjustments in two different planes. First, rotate the saw on its vertical pivot to set the miter angle, then rotate it on its horizontal pivot to set the bevel angle. Finish carpenters often need to do this when installing baseboards and crown molding. Using a chamfer bit, you can make a beveled edge with your router. The most accurate way to bevel the ends of a piece of wood is to use a compound miter saw, but that won't work for beveling along the length. For that, you need either a table saw, a circular saw or a router. Of course, you first need to calculate the angle you need, and that might take a little math. To make a bevel cut with a table saw, you first change the blade angle from 90 degrees to the desired bevel angle, using the angle adjustment control on the front of the saw. The control is graduated to tell you the blade angle, but the scale isn't always accurate, so it's best to check the blade angle with a protractor or a bevel, which is a tool that carpenters use to measure angles. Once the blade angle is set, just push the wood through to rip it to the proper bevel angle. You can use a router to convert the straight edge of a wood piece to a beveled edge by fitting the tool with an angled cutting bit called a chamfer bit. Clamp the wood firmly and use a bit with the desired angle to shape the edge and produce the desired bevel angle.